As a major step towards the digitization the Tamil Nadu government has taken a big step. In a recent time the state government has planned to launch a Smart Ration Card that will soon replace the conventional ration card. All the citizens of the state of Tamil Nadu will be able to get their portion of ration through smart ration card. Those who are ration card holders can easily apply for the smart card through online application. There is no offline process of registration is available for this facility. There are few steps that can be followed to register for the card. Step 1: https://www.tnpds.gov.in/ this is the official website for Tamil Nadu Public Distribution System. One has to click on the link to proceed further for the registration. 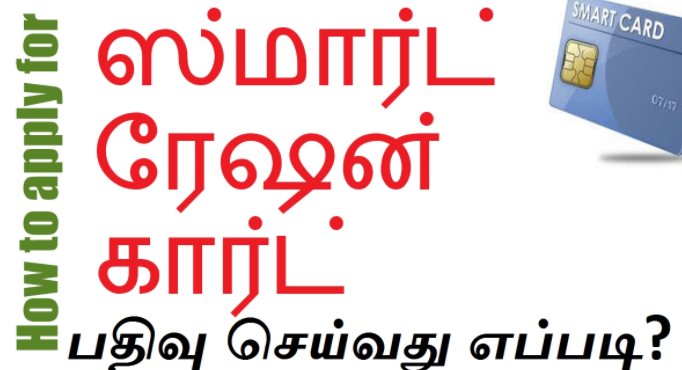 The website appears in Tamil language for your convenience you can translate the page to English. Step 2: See the right side of the home page where you will find a tab called ‘useful links’. Under this tab you will get a list of links that are associated with many proposals and tenders related to state PDS. In that list you will get ‘Smart Card Application’ link at the first place. Click on the link. Step 3: Once you click on the link you will get the application form details. You will get two languages there in the page, one is local language and the other one is English. You can choose either of the language as per your requirement. Step 4: Start filling the form with important information. First you have to choose whether you are applying for new card or you are enrolling with old card. Select from the option given in the page and proceed further. Step 5: Further fill up the form accordingly. Add information like name of the head of the family, age, gender, address, mobile number and email ID. There is little mandatory information that has to be mentioned there. Follow the red star marked boxes in the page. Step 6: once you are done with the information, select the type of card you want, no commodity card, rice card, sugar card or other. Then select the address and ID proof you are going to upload for the verification. Step 7: You need to upload your photo and ID proof like Aadhaar card, Gas card, Pass book, Passport, electricity bill, rent agreement or such as ID proof. In case you don’t have scanned copy then you can simply click a photo of the original document on your phone and upload it. Also for the photo you can take that photo then and there. The size of the files should be checked before uploading. Step 8: You are almost done with all the process. Now review the information you have given along with the files you have uploaded. If all of them are correctly given then click on the ‘submit’ button to submit the registration form. Step 9: before submitting the form make sure to click on the declaration that whatever information you have given is true. Also make sure that the phone number and the email ID you have given is active as the registration number will be sent to your phone and email ID. Your registration is done successfully. There will be a system generated reference number that will be sent to your mobile number for future reference. Save the number for further steps. The registration takes few days to process. Till then the applicant can follow up or track the status of their registration. Any time after few days of registering for the Smart Card you can click on the link https://www.tnpds.gov.in/pages/registeracard/register-a-card-status.xhtml and check the progress of your registration. Whether the process is progressing or not can be shown in the page. After clicking on the above link you will be redirected to a page where you have to enter your system generated reference number. By clicking on submit button you can track your registration status any time. It will be a major step towards the digitization. The Smart Card will have your Aadhaar Card number which is unique for every person in the country. By doing this it will be helpful to reduce forgery and duplicate card issuance. Secondly with Smart card the accessibility of the commodities will be much easier than before. As now the card will have aadhaar number it will be easier for the authority to identify the people. This in result will help them to easy access towards the commodities. Smart ration cards will be easy to handle as the state government will now have a different database for the people who have ration card. Now people can buy commodities in minimum support price with only the aadhaar number as it will be linked with the database. The concept of Smart Ration Card came to picture when back in 2012 former CM late Jayalalitha wanted to make PDS digital. At that point of time Rs. 500 Cr was allocated for a year to implement the plan. Unfortunately nothing could be materialised at that time. Now according to a report among 6.90 Cr ration card holders, almost 5.85 Cr people have submitted their aadhaar. The authority has started working on the database already. Now the online application/registration has started as well.